Stranded passengers waiting for their flights out of JKIA airport in Nairobi, Kenya, March 6, 2019. More than 5,000 members of the Kenya Aviation Workers Union went on strike Wednesday, stalling operations at Jomo Kenyatta International Airport and forcing travelers were forced to cancel or reschedule their flights. Security personnel broke up demonstrations within the airport's facility. 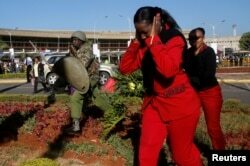 Kenya Airways workers are dispersed by riot police officers at the Jomo Kenyatta International Airport during a labor dispute that grounded flights near Nairobi, Kenya, March 6, 2019. Police used tear gas and batons Wednesday to disperse a demonstration by striking workers at Kenya's main international airport. The workers union, which includes employees from the Kenya Airports Authority and Kenya Airways, went on strike earlier in the day. 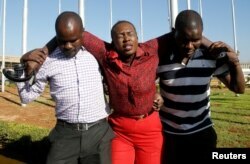 A Kenya Airways worker is assisted after she was injured when riot police officers dispersed them at the Jomo Kenyatta International Airport during a labour dispute that grounded flights near Nairobi, Kenya, March 6, 2019. The union said it is striking because of corruption involving top managers, discrepancies in salaries, and objections to a proposed merger between Kenya Airways, the national carrier, and the Airports Authority, the body responsible for providing and managing all airports in the country. The merger would allow Kenya Airways to run Jomo Kenyatta International Airport. But the Kenya Aviation Workers Union fears the agreement would lead to massive layoffs. Union Secretary-General Moses Ndiema addressed the striking workers before being detained briefly by security personnel. "Today we have commenced a strike action to protest against mismanagement within the aviation industry, to protest against open and blatant corruption within the aviation industry," he said. "We stand here to demand that those who are looting KQ airlines, those who want to muzzle KAA, we are sending the message that the workers of aviation are fed up with you." 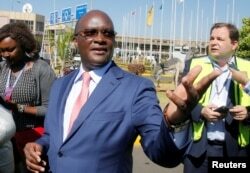 Kenya's Transport Cabinet Secretary James Macharia is seen at the Jomo Kenyatta International Airport during a labor dispute that grounded flights, on the outskirts of Nairobi, Kenya, March 6, 2019. James Macharia, Kenya's Transport Cabinet secretary, said the strike is illegal and called the striking workers criminals. "Nobody has given you a threat that your job will be at risk and yet you go on strike," he said. "You have been given assurances that the numbers are going up in terms of employment and you still go on strike.That is called malice. It is called economic sabotage. It is something that cannot be tolerated. It is criminal activity." He said any deal between Kenya Airways and the Kenya Airports Authority will result in more jobs. "Our aviation sector will be much stronger," he added. "It will need more people. JKIA will become a true hub. That's when they should be discussing what the impact is. If its negative then they can say yes we are giving notice to go on strike." For several years, Kenya Airways has dominated various routes in the African market. However, since 2013 the company has lost money, recording billions in shillings of after-tax losses. The Ministry of Labor on Wednesday set up a team to resolve the strike. Meanwhile, the employment and labor relations court is set to hear the dispute case starting Thursday.